Embroidered towels with "Selamat Menyambut Ulangtahun Perkahwinan yang ke ... untuk Sayang" and a bouquet of flowers. Suitable for celebrating your wedding anniversary. Embroidery area approx: 7 inches x 5 inches. 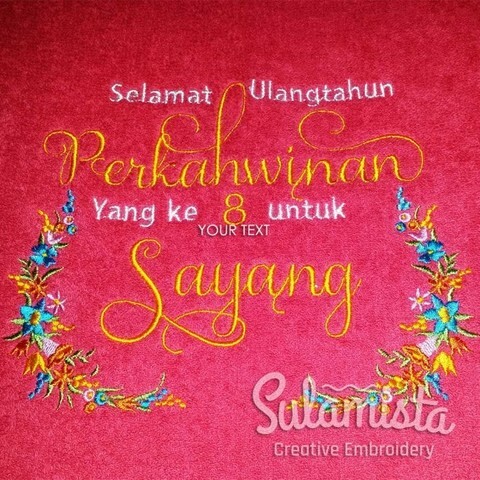 Optional FREE of charge: Embroidery of the names of the couple and year of anniversary. This listing is for one personalized embroidered wedding themed towel. The towel will be embroidered with the above designs. The text can be customized to suit your needs.